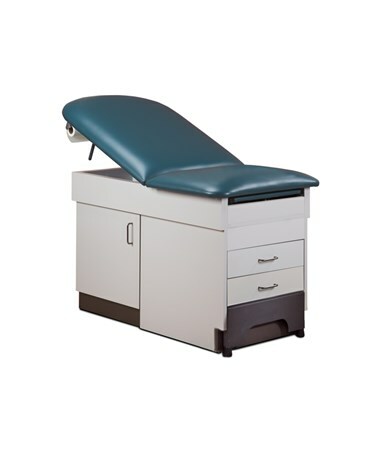 Clinton Space Saver Cabinet Treatment Table with Step Stool features optimal space saving design and brings most value to both practitioner and a patient. It is a versatile, full featured unit that provides a dependable solution for any patient-centric environment, whether it is clinic or a private practice. 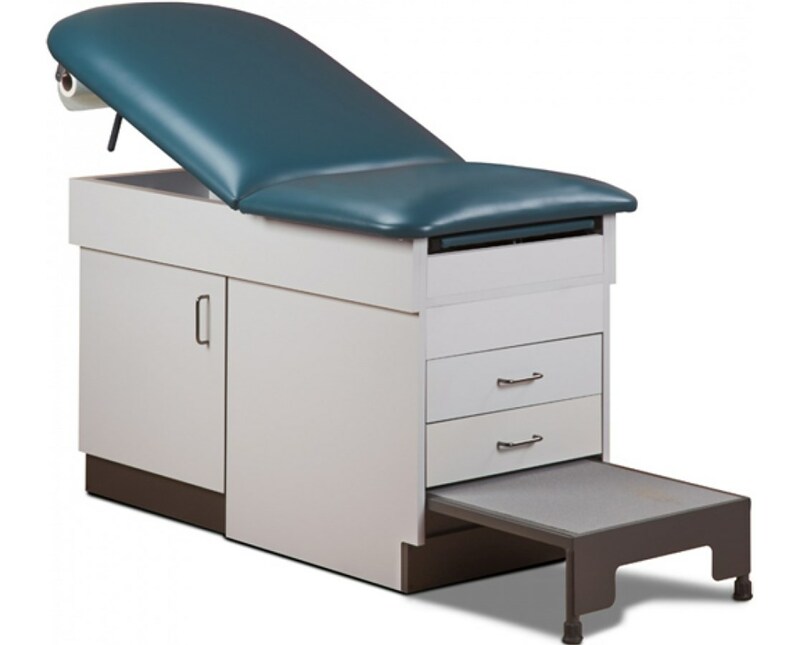 The Clinton Space Saver Cabinet Treatment Table features an excellent design that not only provides a great storage capacity, but is as well concentrated on the comfort of the usage and simplicity of maintenance. First of all the Table is optimized for both right and left handed users. The pneumatic backrest allows very smooth adjustment from both sides of the table. The top cushion with firm 2" padding is covered with a durable vinyl upholstery which is very easy to clean and wipe off dry. The simplified maintenance process helps you create a stress-free working environment and effectively eliminate any risks of patient cross contamination. The all-laminated frame with chip resistant edges also allows easy cleaning and preserves a great exterior condition for many years. The Table features a slide-out leg rest which is fully laminated and placed on the steel track. With extended leg rest the Table reaches 72" in length. Easily accessible height of 31" fits most patients, however, Clinton Industries have assembled this unit with a pull-out style step stool to help you reach out to various patient populations and save you the hustle of ordering the step separately. The step stool is 7.75" high and features a reliable safety tread. 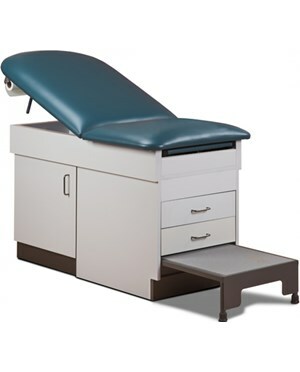 This Treatment Table offers a generous weight capacity of 400 lbs and comes with a paper cutter. 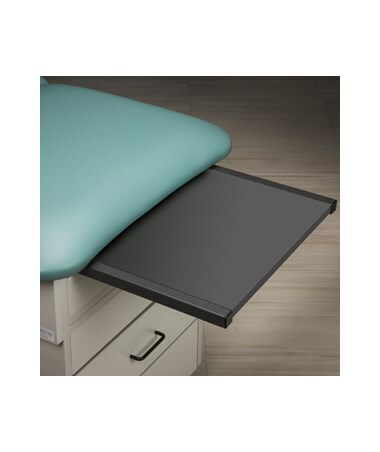 Clinton Space Saver Cabinet Treatment Table is a real space saver that offers a generous storage capability. Its overall length has been minimized with the implementation of the slide-out leg rest. But Clinton Industries went further and assembled the Table with a spacious side storage compartment with shelf, accessible from both sides. Two large drawers feature Euro style and are assembled with all steel slides for quiet and easy operation. It also features silver drawer pulls. 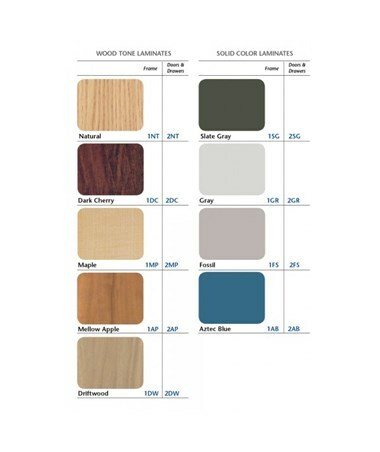 The Clinton Cabinet Treatment Table features many optional configurations that include the choice of color combinations for both upholstery and drawer doors. 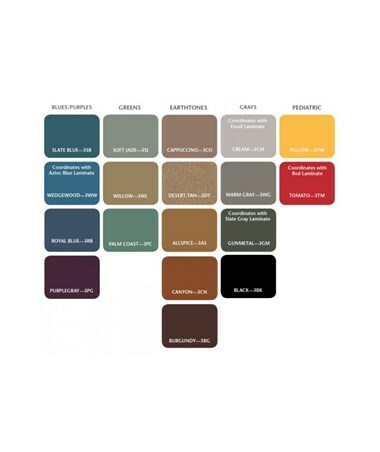 To order your customized Space Saver Cabinet Treatment Table with Step Stool simply go to "Customize & add to cart" and complete your purchase in a few easy steps.